The first international expert group meeting on indigenous peoples’ sexual health and reproductive rights will be held at the UN Headquarters in New York on 15-17 January. The UN Permanent Forum on Indigenous Issues has the mandate to discuss indigenous issues related to economic and social development, culture, the environment, education, human rights and health and to provide expert advice and make recommendations to Member States as well as the UN system. Throughout its twelve sessions, the Permanent Forum has made 19 recommendations that deal specifically with sexual health and/or reproductive health and rights. At its eighth session in 2009, the Permanent Forum recommended that an expert group meeting on sexual health and reproductive rights be held. 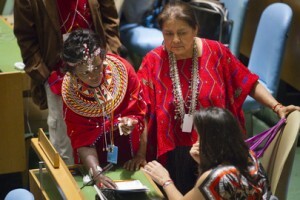 And then at its twelfth session in May 2013, the UN Permanent Forum on Indigenous Issues decided to organize an international expert group meeting on the theme “Sexual health and reproductive rights: articles 21, 22 (1), 23 and 24 of the United Nations Declaration on the Rights of Indigenous Peoples”. recommendations to the UN system, Member States, indigenous peoples and their organizations as well as non-indigenous civil society organizations. The final report and recommendations of the Expert Group Meeting will inform the thirteenth session of the Permanent Forum (12-23 May 2014), and also feed into the World Conference on Indigenous Peoples (September 2014) as well as the 20 year review of the International Conference on Population and Development and the ongoing discussions to define a development agenda beyond 2015. UN DESA’s Division for Public Administration and Development Management (DPADM) is organizing a study visit to Bahrain on 26 January-1 February, to support the adaptation and implementation of e-government practices in LDCs through an in-depth practical and hands-on learning experience. The study tour takes place within the framework of DPADM’s Development Account Project on “Strengthening capacities of the public sector in least developed countries to deliver quality services equitably through the transfer and adaptation of innovative practices”. It aims to expose interested participants from the Least Developed Countries (LDCs) to Bahrain’s National E-Government Programme. While during the study tour participants will be familiarized with the entire E-Government strategy and programme of Bahrain, a special effort will be made to address specific interest of those LDCs which are particularly interested in some modules, such as e-procurement, payroll administration, health or education services, etc. 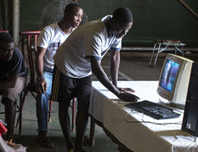 The global debate on a post-2015 development agenda has pointed to a need for enhanced monitoring and accountability at all levels, to ensure delivery on commitments and sustainability of development results. This includes advancing progress on mutual accountability, as an overarching principle for the effectiveness of development cooperation. The third Global Accountability survey will assess how mutual accountability mechanisms effectively support the delivery on development cooperation commitments. It has been launched under the auspices of the UN Development Cooperation Forum (DCF) by UN DESA, in partnership with UNDP. Similar to the first two surveys (2009 here and 2011 here), the third survey seeks to generate evidence to support governments in their efforts to strengthen development partnerships at country level. 140 Ministries of Planning and Finance from developing country governments have been invited to participate and to consult with relevant line ministries, providers and other stakeholders to identify ways to implement tools that support mutual accountability, such as dialogue platforms and aid and partnership policies. By engaging in the survey, stakeholders are also encouraged to address the capacity challenges they may face in strengthening mutual accountability, in light of the changing composition of development finance and expectations of development cooperation in the post-2015 development agenda. The biennial DCF provides a legitimate, yet informal hub for candid and inclusive dialogue on the future of development cooperation in a post-2015 era. The findings of the 3rd global accountability survey will inform discussions at a High-level Symposium on 20-21 March 2014 on how to feature effectiveness and accountability in the post-2015 development agenda, with a particular focus on development cooperation and a renewed global partnership for development. A full repository of information on the mutual accountability work of the Development Cooperation Forum (DCF) is available here. Latest updates on the 3rd global accountability survey, including webinar recordings, are forthcoming.